We know fast food is loaded with synthetic chemicals and is downright devastating to your health, but a newly discovered ‘mummified’ McDonald’s burger visually represents just how little the Frankenfood burger actually changed over 14 years time. It wasn’t until Whipple and his family were sorting through the old coats to donate to Goodwill that he found the old hamburger and decided to inspect it. “We looked at it and said, ‘Oh, my gosh…” he told ABC. “I said, ‘I wonder how long this thing is going to last?””. An interesting challenge, one that I may perform. Would a homemade burger that has been ‘freshly prepared’ (which they say their burgers are) be the same after 14 hours let alone 14 years? How about whether or not it would begin to stink? McDonald’s says it would have actually dehydrated and maintained its amazing form for 14 years. 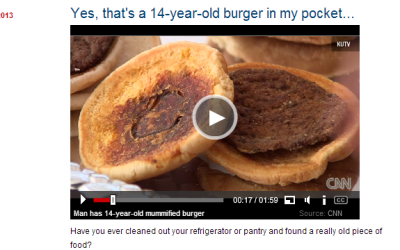 Well, one thing that’s for sure is that the mummified burger owner David Whipple isn’t complaining. He has been offered thousands of dollars for the burger, but instead insists on keeping it as a relic of sorts. I think I’m going to be sick. Isn’t this what Cleopatra had with her when she was mummified? My grandad and his brothers have cows that they have processed naturally by a friend. They share with me and my parents, siblings, etc. because they have so much, they don’t want it wasted. This is the best beef ever. I cook it and it hardly makes any grease. The store brands leave a cup or more. Nasty. I make stuffed cheeseburgers and jalapeno burgers, meatloaf and more. I try to avoid grocery store beef. I definitely avoid fast food burgers at all costs. McDonald’s being one of them. I don’t want something that the plague won’t even kill going in my stomach. Even bacteria wont eat it. Or mould. The cockroaches must have tried and failed to use it as food. He turned down $5,000? Really?! …and it's just as nutritious now as it was 14 years ago! It does have one thing going for it however, it is probably GMO free. Mmmmm! Does that mean it will keep me full for 28 years if I eat 2!!!!??? Haha, that’s soo gross!!!! I almost passed a mcnugget from laughing.